Ann Rose Opdenaker Johnson, of Conroe, TX, passed away surrounded by her loved ones on Sunday, February 3, 2019 at the Conroe Regional Medical Center. Ann was born on February 12, 1942 in Aston Township of Delaware County, PA to the late Peter and Annie Opdenaker. She was the baby of the family and had 5 sisters and 6 brothers: Peter, Thomas, Joseph, Sophie, Matthew, Albert, Elizabeth, Mary, Catherine, Cecilia, and Frederick. She graduated high school on June 11th, 1961 from the Immaculate Heart Academy in Fountain Springs, PA. 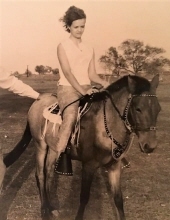 In her early 20s, Ann moved to Rogers, Texas to live with her sister, Mary Ann. Those years living on their small family farm were one of the most joyful times of her life. The sisters formed a bond that would only grow stronger throughout their lives. Ann went on to marry and had three daughters: Paula Faye Harris Alfred, Patricia Jean Harris Voss-Colley, and Ruth Ann Johnson Thompson. She also had three step-sons: Keith, Claude, and Kenneth Johnson. Ann is survived by her sister Sophie Stanwell; her daughter, Paula Alfred; her daughter, Patricia Voss-Colley and her husband Earl “Chip” Colley; her daughter, Ruth Ann Thompson and her husband Kenny Thompson; her step-sons, Keith Johnson and Kenneth Johnson; her 5 grandchildren, Amanda, Ashley, Alexander, Anna, and Alexavier; her 13 step-grandchildren, Christina, Claude JR, Charles, Safina, Aaron, Matthew, Cody, Kendall, Cheyenne, Courtney, Hunter, Alexus, and Summer; her 22 great-grandchildren, Devon, Alissa, Andrew JR, Lexie, Camerin, Kylie, Emma, Parker Rose, Aazeryuan, Aadreaz, Santana, SeanTaylor, Chrissy, Riley, Raylan, Mackenzie, Maddison, Malakai, Katherine, Edward, Joshua, and Hailey; and many other extended family members. She is preceded in death by her parents Annie & Peter Opdenaker, her siblings, Peter, Thomas, Joseph, Matthew, Albert, Elizabeth, Mary, Catherine, Cecilia, and Frederick; her step-son, Claude Johnson; her son-in law, Jay Alfred, and her son-in-law, Leonard Voss. Ann, or as her father called her, Little Annie, was one of the world’s most courageous and mighty warriors of good and all things made of light. A force to be reckoned with yet was as gentle as the slightest brush from an angel’s wing. A giant spirit packaged in a tiny body. A champion not only for her three daughters, grandchildren, family and friends, but also God’s gift to us... animals. She was a kind spirit, one that everyone admired and loved. She didn’t care if you were rich or poor, what religion you believed in, who you voted for, who you chose to love, or what color your pigment was. She was slow to judge, but quick to lend a hand. A tiny but loving and mighty hand. She lived simple and modest life, giving everything, she could to help those she loved. Her most cherished role in this life was being Mom and Grandma. Though Ann may be gone from her earthly body, she will live on in the hearts of her children and grandchildren. We are all richer, wiser, stronger, and determined to succeed because we were blessed to share in her beautiful life. A memorial service will be held Saturday, February 23rd at 11 am at McNutt Funeral Home located at 1703 Porter Road in Conroe, Texas. A reception will follow at a location that will be announced at the memorial. In lieu of flowers, please considered donating in Ann’s name to the Conroe Animal Adoption Center located 407 Sgt Ed Holcomb Blvd. To send flowers or a remembrance gift to the family of Ann Rose Johnson, please visit our Tribute Store. "Email Address" would like to share the life celebration of Ann Rose Johnson. Click on the "link" to go to share a favorite memory or leave a condolence message for the family.